body-conscious or asymmetrical, and always modern. 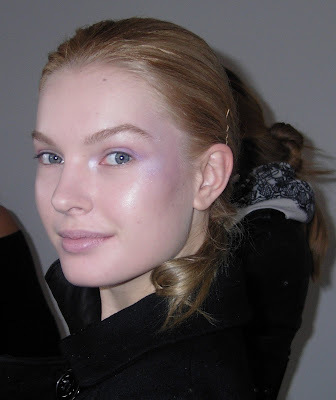 the cheekbone, so that it caught the light with an iridescent effect. Fall 2010) was applied in the crease. Nails: In a minimalist touch, nails were left bare. straight back and down, then separated into two inward twists. 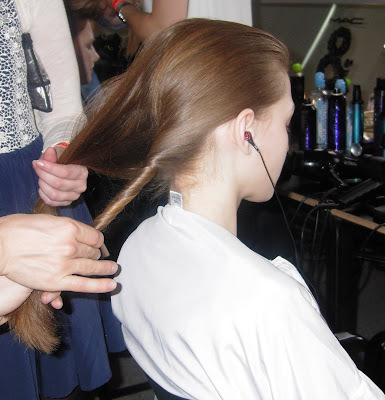 of TiGi Catwalk Firm Hold Hair Spray. Jessica: I think this was the most lovely look so far. Very fetching and pretty. Can you get any details on exactly what they had on the model's lips in the first picture? It looks so close ot my long lost HG, Chanel Silver Mauve lippie!!! Kristy: J is reporting that it is a Pro creme base from MAC. I have no deets on the exact name. I am writing this question down and I will ask MAC PR after Fashion week is over. I wish I was more familiar with Pro products. BTW: I have heard of that Chanel lippie. It is a legend. Sogni: I agree!!! Ladylike too! 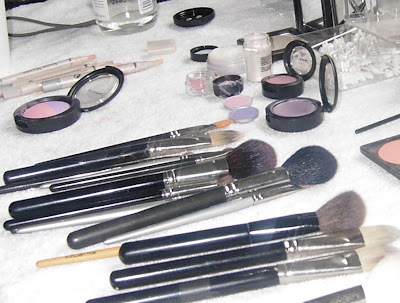 Annie, I'm inspired to add a sheer lilac shadow to my makeup bag! I think it's a very adaptable look. Kristy, it was hard to get exact info on the lips, other than that they were using Cream Color Base. I didn't see any actual lipsticks on the tables... so I'm guessing it was a pink shade of Base, maybe with a bit of Pigment mixed in? They were more interested in telling us about the eyes! Sorry! I totally remember that New Order album, too - I always wanted it. That said, I can't wait for these e/s to hit the MAC counter this coming Fall. Very soft and pretty! Thanks,Jessica!